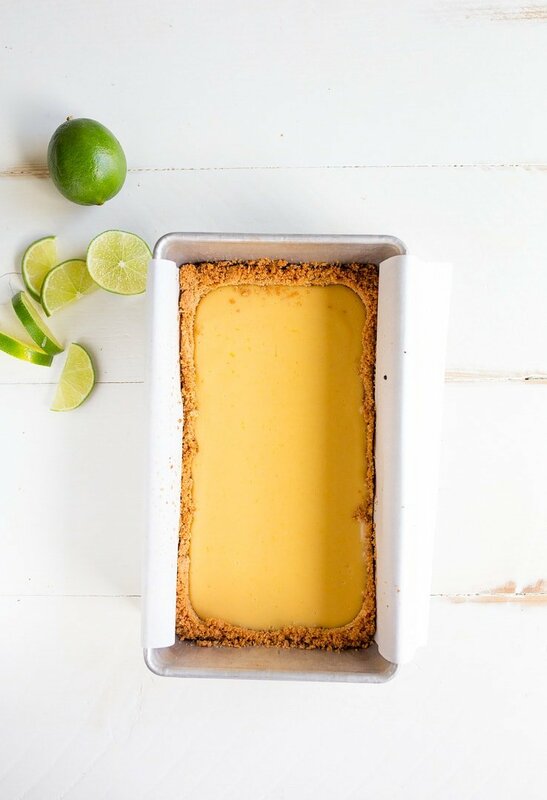 Key lime pie recipe in a loaf pan. Small key lime pie for two people (recipe makes 5 slices of pie). 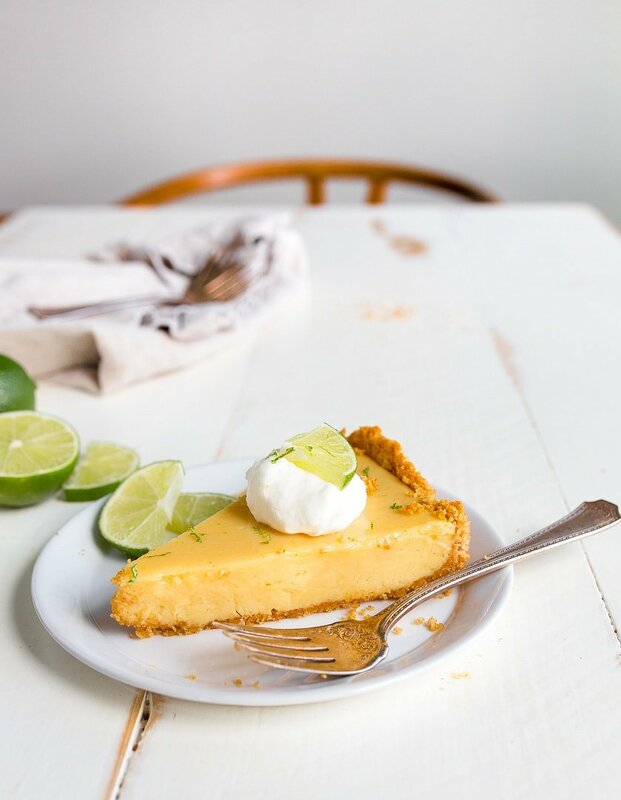 I can barely contain my excitement over this small batch key lime pie recipe. I love that you and I both love making small batch desserts in a loaf pan. We’ve made a cheesecake in a loaf pan (several times, actually (lemon blueberry cheesecake and a plain cherry small cheesecake in a loaf pan). We’ve made small batch brownies in the bread loaf pan for years. And up until this key lime pie recipe, this small angel food cake in a loaf pan with microwave lemon curd (of course) was my favorite. But, after one bite of this cool and creamy key lime pie, and I’ve officially been swept off my feet. This is my new favorite small pie to make! Plus, it’s so easy because it uses the bread loaf pan we all have in our kitchen! I didn’t use key limes. So sue me. I couldn’t find them, and I’d rather use fresh lime juice and zest than bottled key lime juice. 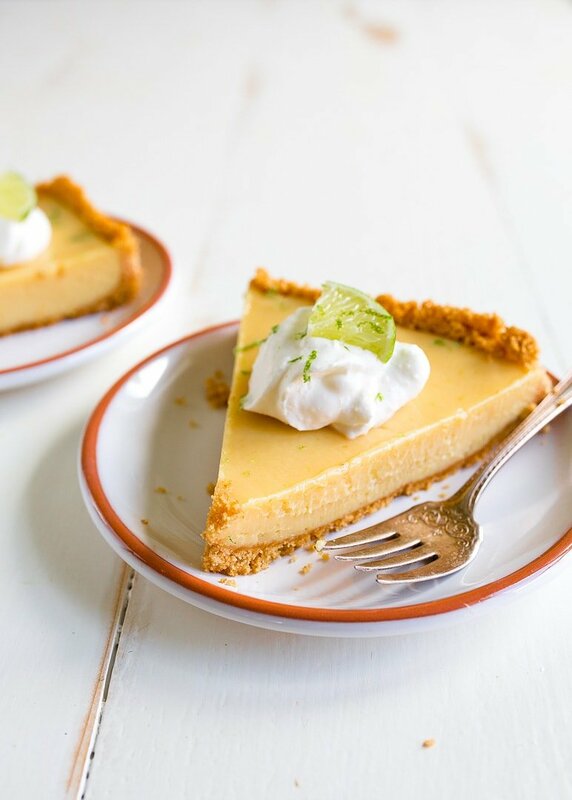 To replicate the sweet tanginess of a key lime, add 1 tablespoon of lemon juice. We’re using a bread loaf pan to make a small pie with 5 slices. This is the exact pan I use for all of my small-batch desserts in a bread loaf pan. Use a shot glass to pack the graham cracker crust firmly on the bottom and up the sides. It wouldn’t be the end of the world if the filling went above the crust, but there’s enough graham cracker crumbs to prevent it, so try to make the crust look like the photo below. Once you bake the pie, you want to place it in the fridge to set overnight. We’ll wait on the eggs, citrus, and sweetened condensed milk to thicken properly overnight. Plus, key lime pie is better chilled! This pie is worth the wait. It sets so perfectly and creamy. I used a slightly higher proportion of egg yolks so that the slices would stay together more easily when slicing. The pie still melts in your mouth, though! Since this pie only uses egg yolks, be sure to check out m collection of recipes that use egg whites only. I love that this pie has such few ingredients! In fact, when I went to make this recipe for you, I didn’t have to head to the store at all! My counter was overflowing with limes (ahem, summertime sangria margaritas are underway), and I always have sweetened condensed milk in my pantry for my making my easy fudge recipe. Just 6 ingredients to pie! Well, plus whipped cream! I hope you love this small key lime pie recipe, and that you find 4 friends to share it with. Or, maybe there’s just one other person and you have a piece each night until you share the very last piece. Either way, I hope your summer is full of creamy, tart key lime pie for two. A small key lime pie recipe made in a loaf pan. Line a 9x5" bread loaf pan with parchment paper with overhanding sides to use as handles to lift out the pie later. Spray the pan with cooking spray. Next, in a food processor, combine the graham crackers, melted butter and sugar. Pulse until the crumbs are fine crumbs and look like wet sand. Press the graham cracker crumbs into the pan, and using a shot glass, press the crust up all sides of the pan by 1". Take your time and press it firmly. Bake for 10 minutes, and let cool. Leave the oven on. Meanwhile, in a small bowl, whisk together the condensed milk, citrus juices and egg yolks (reserve the egg whites for another use). Grate the zest of 1 lime using a microplane grater into the mixture and whisk to combine. Pour the filling into the crust and slide it back into the oven for 18-20 minutes. When the pie is done, it will be very slightly jiggly. Let the pie cool to room temperature, cover it with plastic wrap loosely, and refrigerate overnight. Serve the pie with whipped cream and extra freshly grated lime zest on top. What’s the best way to remove the pie from the loaf pan? I would be worried about inverting it but trying to lift slices out of a loaf pan seems like a surefire way for crumbles- delicious crumbles but still. I leave the edges of the parchment paper long so that they can be used as handles to lift the pie out. Sorry if that wasn’t clear from the directions! After sitting in the fridge overnight, it’s easy! You make me feel heard! haha! Although, I’m sure I wasn’t the only one that asked for this on Instagram when you asked for ideas, you still make me feel heard. I cannot wait to make this. I’m a little banned, at the moment, from making desserts though. I made 3 batches of your Red Velvet Cupcakes for a friend which means I was left with egg yolks. So then, I made your Chocolate Cherry Coconut Bars, Banana Bread, Small Batch Sugar Cookies. Then, I also had some leftover cream cheese, so for good measure, I also made your CREAM CHEESE POUND CAKE WITH STRAWBERRIES. Yes, I did this all in ONE day. HOWEVER, everything but the cookies were sliced and individually wrapped and frozen. I can report that these taste just as incredible when defrosted as they did right out the oven. The cookies were rolled into dough balls and frozen as well for easy baking when a craving hits. Needless to say, I’m not sure when I will be able to convince my loving bf that I NEED to make this Key Lime Pie. Thank you so much for all your hard work!!!! This is the greatest comment I’ve ever received, Ericka! Wow! I love you! I have graham cracker crumbs from a box, how much should I measure out to make the base for this key lime pie? I’m sorry, Anna, but I have no idea. I always use sheets. Is there a conversion on the box or anything? Let me google it. You’ve read my mind…. I bought a bag of key limes over the weekend because they were so cute! Now I have THE perfect recipe to make MY favorite pie. Key West memories will be vividly recalled when I bite into this pie ~ can’t wait! I love you, I love you, I love you! This is my favorite pie, my mom made it for me as my birthday cake when I was a teenager and didn’t like cake. I absolutely adore that you kept it simple, that’s how it’s made in the Bahama’s where my mother learned the recipe. Going to make this pie this afternoon. . . oh yes indeed, and did I mention that I love you. . .
During the summer the lemon pie is the best pie ever! A bit of work but seems the best recipe so far! 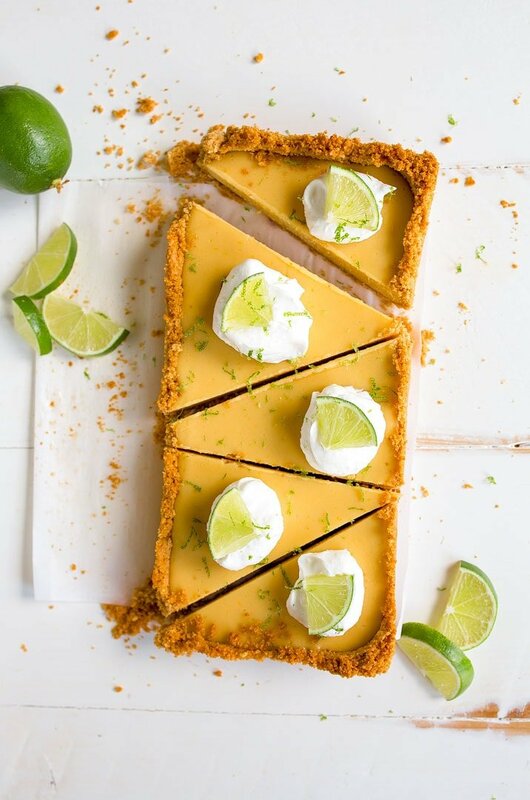 This key lime pie looks absolutely amazing, thanks for sharing the recipe. Hello Christina! 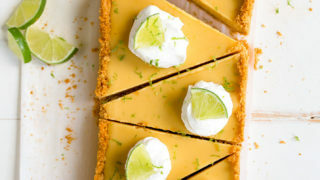 The recipe looks amazing and as I love key lime pie I want to make it for sure. Only problem is I don’t live in the US and we don’t have graham crackers..What’s available is digestives which are pretty much the same. What quantity of those should I use? 8 graham crackers is about a heaping 1/2 cup of crumbs. Just crush up your digestives until you have slightly more than 1/2 cup of crumbs. Also, I found this on google: It’s 1/7 to 1/8 cup per cracker, or more simply, 0.5oz or 15g per cracker.You generally need 1.5 cups of crumbs for a large 9″ pie crust, and it takes 10-12 crackers. This is delicious! I made it for dessert tonight and I am going to make this a lot! I love key lime, like key lime pie was my birthday cake love. 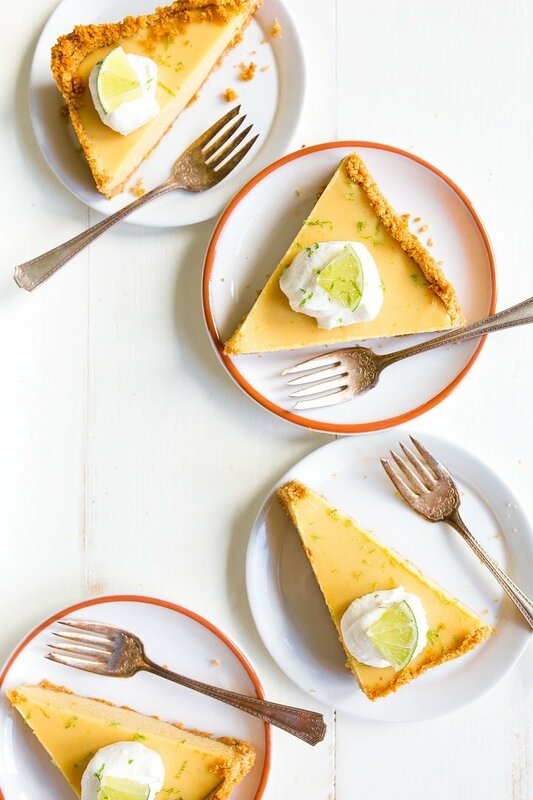 It’s hard to find key lime that has the right tart to sweetness. This recipe has the right balance. I might eat the whole thing and not share with the fam.😏Thank you! Christina, I made two of these lovely key lime pies for a fancy pot luck dinner. Guests kept arriving and, after a fabulous meal, 1/8 of each pie with whipped cream and a slice of lime was perfect for each guest. If I’d made a traditional round pie, I bet it would have been difficult to serve a narrow slice. From the bread pan, the serving lifted perfectly and looked like it was always meant to be! Who knew you crafted hostess mental health into your recipe, too? Many thanks. This looks fantastic! Would it be possible to have a volume measurement for the crushed graham crackers? I would like to do a wheat free substitution.